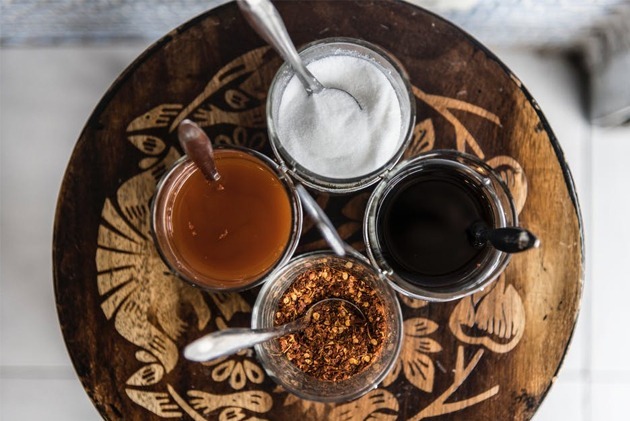 If any dish is too bland, dry, or just needs something special, a sauce can come to the rescue. The right sauce can turn a culinary experience around, but the ones available in stores are usually full of preservatives. For this sauce, all you need is some butter and sage, with seasonings as required. Take one tablespoon of butter for each serving of food your making and heat it on medium-high until it turns brown. This would emit a fragrance when ready, so be sure to keep an eye on it. Once this is done, take the skillet off the heat and mix in some thin slices of fresh sage. Let this steep a little, and then you can use this sauce on ravioli, chicken breasts, and mashed potatoes. Make a tomato sauce with a twist by giving some tomatoes and cloves of garlic a roasting session. Whole canned tomatoes that have already been peeled would yield the best result here. Cook the tomatoes in the oven at 425 degrees for 35 to 40 minutes. This would make them jam-like and soft. The cloves can be roasted for a few minutes until they’re crispy. Put both these items in a food processor or blender, and then puree them until they’re smooth. The results, after seasoning with salt, pepper, and oregano, will make a delicious pizza or pasta sauce. Tahini is a sesame seed paste in itself, which you can easily make by blending olive oil and sesame seeds in a grinder. It’s also available in readymade form in most grocery stores. Miso paste is a Japanese condiment made from fermented soybeans and is also easily available in stores. When combined, both these thick sauces create a lovely blend of nutty, creamy, sweet, and salty flavors. Since the result would also be very thick, you can use the resulting sauce as a dip or add water to make it thinner. When you cook or sear meat in a pan, you usually have some of its juices and browned bits left at the bottom. Don’t drain these away. Add in a few tablespoons of flour and some chicken broth. Season to taste and add some cream if needed. Take a whole Meyer lemon, unpeeled, and put it into a powerful blender. Add olive oil during the blending process, just a little at a time. Eventually, this sauce would come into shape. You’d need around a quarter cup of olive oil for each lemon. You’d soon get a bright, balanced sauce that’s sweet yet acidic in taste. This would go perfectly with any baked or grilled fish, vegetables, etc. Yogurt and pesto can be bought at the store or made at home. Whichever kind you have on hand would do fine. All you have to do is mix the two together and add water to thin it out if needed. Sriracha is a favorite condiment in America. It provides a hot, spicy taste and is thick in texture. Soy sauce, on the other hand, is a favorite in Chinese cuisine in the same part of the globe. This is a slightly sweet, savory, thin sauce that can absorb into almost any dish. Combining these two would create a nice mixture of spiciness and sweetness that can become a dipping sauce for meat or vegetarian dishes. The more sriracha you add, the thicker this sauce would be. Sauces don’t always have to be savory. Sweet sauces like caramel, chocolate sauce and strawberry sauce make great toppings for ice-cream, frozen yogurt, and several other items. It may sound intimidating if you haven’t tried it before, but you can make your own sweet, fruity sauce at home in minutes. This is called a coulis and is best made with fresh fruit. All you need here is the fruit in question and some sugar. Berries would be best, but feel free to experiment with any kind you like. You can even use frozen fruit if you don’t have fresh on hand. Simply blend ten ounces of berries or fruit with two tablespoons sugar. Sieve the mixture and pour the resulting sauce onto any dessert. Try using lemon cream to top up a cake or pie instead of frosting or ice cream. The light, sweet taste is incredible and goes with just about any dessert. Next time you have a plain sponge, fold a little lemon curd into the whipped cream. This would create a sweet, tangy sauce that would go well with cake pops, pound cake, or a piece of pie. We’ll wind up with a sauce that may be a bit more difficult than the others. Chimichurri is a steak sauce that originated in South America. It’s similar to salsa verde, but a little spicier. To make this, you need a red chili, a garlic clove, a bunch of coriander and another of parsley, three tablespoons red wine vinegar, and two tablespoons olive oil. You would also need a food processor, in which you’d first blend the chili, garlic, coriander, parsley, and vinegar. Once all of this is finely chopped, add in the oil and turn on the processor again. The sauces above can contain as much salt, pepper, and other seasonings as you wish. However, take care that the final result doesn’t overpower or overwhelm the taste of the food it’s on. A good sauce would bring out the flavor of the meat, potatoes, or rice that it’s put on, not mask it. Be confident in experimenting with food and seeing what versions of sauces you can come up with based on the ones discussed here.